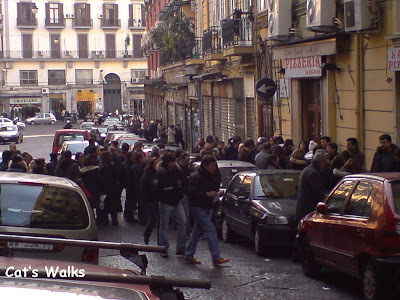 Between christmas and new year we were in Naples, Italy. The birthplace of pizza. When in Naples, it is a must to go to Pizzeria Da Michele. For Napolitans this is the best place to eat pizza in Naples, period (and therefore the world). We had to wait 2 hours in the winter cold for a table! (check the pictures) Napolitans are willing to wait even longer actually. We went there early so we didn't have to wait so long (apparently 2 hours is still quick for this place). The pizza was really worth the wait even though you can only get margerita (tomato sauce, garlic, basil, mozzarella) or marinara (tomato sauce, garlic, basil). With their secret dough recipe, the pizza dough is so soft and elastic it is almost like a crepe. The restaurant itself is very simple. People don't go there for the ambiance but for the food. Immediately after eating, one actually have to leave fast out of consideration for the hundreds of people waiting outside.